Below you'll find some cool Little Mermaid Party games ideas for your kids birthday party. "Lots of fun Little Mermaid Party Games!" If you have not looked at our Ariel Birthday party ideas, have a look at those ideas too! There you will find lots of Mermaid Birthday ideas for decorations, invitations, food ideas and much more. 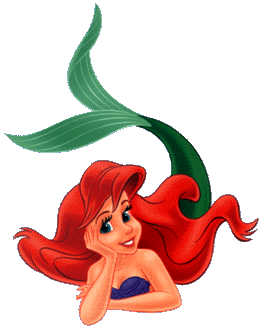 But now scroll down and check out our cool Little Mermaid Party Games. Hide Little Mermaid: Before the game lay two ropes a good distance apart on the play ground. There has to be plenty of space for the kids to run around between the two ropes. One player has to be the Shark and have her stand in the area between the two ropes "THE OCEAN". The other players are the little mermaids and they stand behind on one of the lines. The little mermaids have to cross to the other side of the rope "THE OCEAN" without being tagged by the Shark. At the start of the game the Shark yells "Cross" and all the little mermaids have to cross the Ocean without being tagged by the Shark (they have to run from one side of the rope to the other side and cross the ocean). The mermaids who gets caught by the shark becomes a shark next time the mermaids have to cross the ocean. Then the next round begins again, until all the little mermaids become sharks. Finding Ariel's Treasure: Divide the kids into 3 groups and give them their treasure maps (do this with your computer). Place different Ariel related items (plastic shells, Ariel figures, etc), around the house and let the kids find them, the groups who find their items fastest wins. Before starting to play give each group their small mini bags to hold the treasure. Give the kids 30 min to find the goodies, give them more time if they are younger. Mermaids Waves: Make waves for the little mermaids. Before the party get one bottle and cap for each child (without labels on the bottles). The day of the party gather the kids to a table with all the materials spread on the table (bottles & caps, 6 ounces of cooking oil per child, 6 ounces of vinegar per child, blue food colouring, glitter, a little plastic mermaid). Using a funnel, pour the six ounces of cooking oil into each child’s bottle, followed by six ounces of vinegar. Let the kids watch how the fluids interact with each other. The oil goes to the top and the vinegar to the bottom. Pour some drops of blue food colouring into the bottles and let them again watch the changes in the bottle. Put a little mermaid inside the bottles, close the caps and let the kids shake their bottles to make "WAVES". Fishing pole: Make fishing pole out of a stick with a magnet on the end. Let the kids catch a fish made out of paper with magnets on the back, in a mini pool. Whatever number the fish has on their back, that's how many candies the kids get. Fish Relay: Divide the children into two teams. Place equal number of goldfish shaped crackers in two shallow containers and place them 15 to 20 feet from the teams. Give each team a spoon. One at a time the children have to run to the container of goldfish, pick up a goldfish with the spoon, return to their group, drop the goldfish into the empty container and hand the spoon to the next runner. The fastest team that transfers all the goldfishes to the empty container, wins! I hope our Little Mermaid Party games will help you in your planning and I hope your little princess will enjoy her games and her Mermaid party.